While using the locale as Spanish, it is noted that there is a localization issue in the 'Cell Properties' dialog. 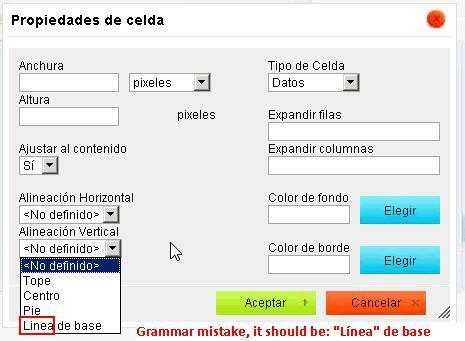 In the 'Vertical Alignment' drop down the translation for 'Baseline' is 'Linea de base'. It should be as shown in attachment. Thanks. I'll add your remarks to the dev site. Though I would have seen your posts even you would have made a single "localization" post instead of 4. The thing with bunching up more than 1 bug into one is that it becomes very difficult to track them later ... pain I experience very often at workplaces.